Unibet are less well known than some bookmakers but are gaining a good reputation in the UK and Scandinavia thanks to their feature packed and promotion heavy service. Bet £30 get refund if you lose. » Cash in your bets. » Less attractive opening bonus. » Load speed issues on poor connection. The welcome bonus provided to new Unibet customers is somewhat different to most bookmaker’s new customer promotions, and offers to refund a customer’s first sports bet up to a maximum of £30 if it loses. The refund is credited as bonus funds to the players account, and before they are able to withdraw it they must have wagered an amount equal to at least three times the total bonus amount through their account. For the purposes of this bonus, only bets at odds of 1.4 or greater will contribute to those wagering requirements and the bets must be settled within a period of 30 days. *Find more info on our Unibet free bet page. European Football Acca Insurance – Applicable to all Champions League and Europa League matches, Unibet’s acca insurance gives customers their stake back as a free bet if their £10 four-fold or greater match result acca is let down by just one leg. In order to qualify, the original acca must have combined odds of at least 2/1. T&C’s apply. ‘90+’ – Another innovative offer provided by Unibet, their 90+ football offer provides money back on losing bets up to a maximum of £50 across a variety of selected markets if there is a goal scored after the 90th minute in the match in question. The offer is currently available for Premier League, Champions League and La Liga matches. T&C’s apply. To see all promo’s visit Unibet and select ‘Promotions’ tab. Unibet TV – Unibet’s live streaming service sees the vast majority of UK and Irish horse races and hundreds of other live sporting events available to be viewed every month. In order to watch the general sports streams a customer must have a funded account or to have placed a bet in the past 24 hours, and to watch a horse race they must have bet at least £1 on that race. ‘Sportsbook Live Betting’ – What the company call their in-play betting provision, Unibet’s ‘Sportsbook Live Betting’ offers in-play markets on a good variety of global sports on a daily basis. Within the live betting section for any match or event, customers get decent live scoring presented along with the available markets and regularly updating prices. ‘Ca$h-In’ – Essentially what most companies call cash-out, the ‘Ca$h-In’ function of the Unibet site allows customers to call time on a bet during the event and take the returns offered at the point they decide to do so. For Unibet customers, this is only possible through the ‘Sportsbook Live Betting’ section of the site, meaning that it can only be done on in-play markets. Statistics Centre – Separate to the main betting sections of the Unibet site is an impressively comprehensive statistics centre, which provides good information on tournaments and players for a wide variety of sports. Any fan of betting on the move will be pleased to learn that Unibet have mobile apps available and that the variety of those apps on offer cater for users of any type of device. There are downloadable versions of the Unibet app for iPhone users, iPad users, Android devices and even Windows phones and also a mobile web app accessible via any devices internet browser, which is almost identical to those which can be downloaded. Whatever your preference then, access to the Unibet mobile is easily achievable. The app itself excels in terms of how easy it is to navigate, with a good layout and intuitive bet slip making it simple to locate the bet that you want and to place it. Unibet TV, the company’s live streaming service, is also fully available for mobile users which is not the case with a number of the provider’s competitors. One slight bugbear of the Unibet mobile app however, is that the makeup and design of it can make it a little slow to load, both at the outset and when moving from one section to another… a shame because it’s one of only a few negatives found in this Unibet review. A company with its roots in Scandinavia, Unibet is extremely popular in Northern and Central Europe and has always largely focussed its service on that market. It is for that reason that their online sportsbook and company in general is so football-centric but in recent years Unibet have been expanding quickly into the UK and other new areas. The company’s reputation in its European heartland is second to none and is a key reason why it remains on of mainland Europe’s biggest bookmakers, and a similar reputation for security and fairness is also growing in Unibet’s newer markets. All in all, whilst some people may still not have heard of them, Unibet are a generally trusted and successful bookmaker. 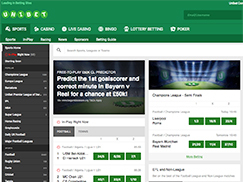 As a major multi-national online bookmaker, Unibet have all of the security mechanisms you would expect to protect their site and their customer’s personal and financial data from potential fraud or cyber-crime. This includes the use of 128 bit SSL technology to encrypt all information sent to and from the site, and Unibet’s SSL certification comes from industry leading company Trustwave. Any stored data is also kept encrypted within the company’s secure systems, which are protected by firewalls and a 24/7 ‘Intrusion Detection System’. If a customer’s safety concerns are more focussed on the potential for themselves to fall into irresponsible gambling habits, Unibet have measures in place to help their too. These include functions for customers to set a deposit limit on their account and to self-exclude from Unibet for a period of between six months and five years. The customer support offered by Unibet comes in three main forms, with users able to seek assistance over the phone, via live online chat or by email. The live chat and email options are available 24/7, whilst the telephone helplines for the UK are open between 07.00 and 01.00 on weekdays and 07.00 and 23.00 at the weekend. Average response times for all three methods of customer support are displayed via the ‘Contact Us’ section of the Unibet website and for email are typically a matter of hours, phone a matter of seconds and live chat a matter of minutes. Unibet are amongst the largest online bookmakers in Europe, are unquestionably a good option for any potential punter looking for a reliable and easy to use sports betting service and are particularly good for those who most enjoy betting on football. The range of markets and events covered across a variety of sports are impressive, but it is in the area of football that customers will find the most interesting promotions and other features. The Unibet TV live streaming service for instance, is a really good way to enhance customer experience and features a huge number of football matches each month, as well as other sporting events too. Unibet’s widely available and easy to navigate mobile app is another real plus point for customers, and the fact that Unibet TV is still available on mobile devices is an added bonus. Whilst Unibet do provide a good overall service, there are a number of ways in which they fall behind some of their main competitors, especially if a customer is not solely focused on football betting. The company’s promotions for instance, are generally few in number and are almost solely football focused. Their welcome bonus too is unfortunately one of the least generous around, providing only a maximum of £30 to customers and requiring them to wager at least six times the bonus amount before they can withdraw it or any winnings associated with it. As mentioned above, both Unibet’s main desktop site and their mobile app is easy to navigate but they are unfortunately also often frustratingly slow and the long loading speeds present on both can certainly stand to be improved. If you’d like to get in touch to ask us anything about this Unibet review then you can do so via the contact page.